In this lesson, we will learn how to classify angles according to their measures. Count the acute angles in this picture. Which point is the vertex of the angle? Which of the following defines an acute angle? AAn acute angle is an angle whose size is more than and less than . BAn acute angle is an angle whose size is equal to . CAn acute angle is an angle whose size is more than but less than . DAn acute angle is an angle whose size is equal to . EAn acute angle is an angle whose size is more than . Which of the following defines an obtuse angle? AAn obtuse angle is an angle whose size is more than but less than . BAn obtuse angle is an angle whose size is equal to . CAn obtuse angle is an angle whose size is less than . DAn obtuse angle is an angle whose size is equal to . EAn obtuse angle is an angle whose size is more than . What is the measure of a straight angle? 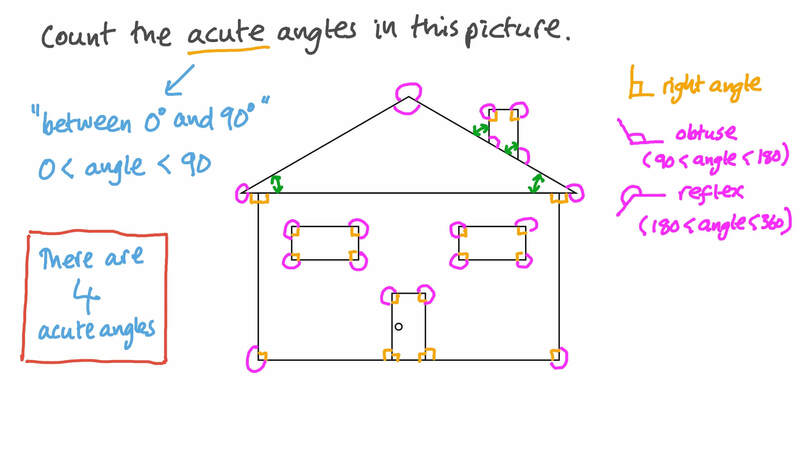 Determine the type of the angle highlighted in orange. How many obtuse angles are there in the figure? What kind of angle is in the figure? Karim got home at 8:00. If he wants to wait until the hands of the clock form a right angle before going out again, until what hour must he wait? Mona set her alarm at 4:20 am. When the alarm rang, she snoozed it for 10 minutes. Determine the type of angle that the two clock hands will form when the alarm rings a second time. Which two rays are the sides of this angle? What is the name of the labelled angle? How many degrees are there in a straight line? Determine the type of angle that the two hands on a clock form when the time is 06:05. At which of these times do the clock hands form a right angle? Determine the type of angle that the two hands on a clock form when the time is 01:30.